The 365 Project is officially complete. Unreal really. Interestingly several people have told me that it isn't actually over, it's only just beginning. I suppose on some level they are right. Who can say when a project really ends? As a way for me to come full circle I decided to make a trip back to Savannah, exactly one year after the start of the project. My goal was to take a shot of the monument in daylight, and do my best to capture the scene in a less abstract way. I also felt as though I didn't really know what the monument itself looked like. I had a general sense from pictures I found online, but I needed to see it again with fresh eyes. Let me provide a brief recap on how I ended up 365 images deep into the raw image. Last year I made a trip to Savannah, GA to celebrate my 30th birthday. I made the trip knowing that I would start the 365 Project using an image taken on my birthday. I had the idea that I would use an abstract image because I've had an inclination towards that style of photography, but what image would I use? What image could be interesting enough to work with for an entire year? We were headed back to the car after a delicious dinner at Circa 1875 when I was completely floored by a Vietnam Veterans Memorial in Emmet Park. The light and the shadows stopped me dead in my tracks. I had my 50mm prime lens on my Canon 7dmkii. This lens is perfect for night photography, especially in urban settings. The confluence of lines, light, and color pulled at my heart strings. When I reviewed the image on my laptop I knew it was the one. Flash forward a year later. I felt like I was going to see an old friend I hadn't seen in a year. We departed Gainesville later than I had hoped, arriving in Savannah around 3pm. I now had the eyes of familiarity with me and I immediately went to the spot that captured me a year ago. All the elements I had wondered about or took for granted in the raw image were now making perfect sense. Oh that's just a flag pole reflecting in the water. Oh that hard edge is from the marble slab that lists all the names of the soldiers. How did I miss the writing on the marble slab? I found the colors incredibly striking and the enormity of it all impressive. I took several shots from different points of the monument. I even tried to recreate the original image in daylight. It didn't have the same intensity as the original and the debris in the water was distracting. That night I thought it would be cool to return to the monument in the same setting as the original. Interestingly the lighting was completely different. The high pressure sodium street lights weren't on behind me and there seemed to be more of a fluorescent light on near the flag pole. What I experienced in trying to capture the same moment was the importance of taking the shot as soon as you see it. The same conditions don't always come together in the same way. Catch it while you can. Here's a slideshow of images taken that day. There's also a video at the end of this post recorded by Peter Senesac documenting that afternoon. Many thanks to Peter for his videographer abilities! I don't know what it is about this monument that I feel so drawn to it. When we returned at night on this most recent trip a large raptor type bird came swooping down and back up into the live oaks. I had to do a little wandering to find it again. I couldn't say with certainty the type of species it was, but given the time of day I have to guess it was some species of owl. That really added to the magic of the monument and the moment. What a way to come full circle. 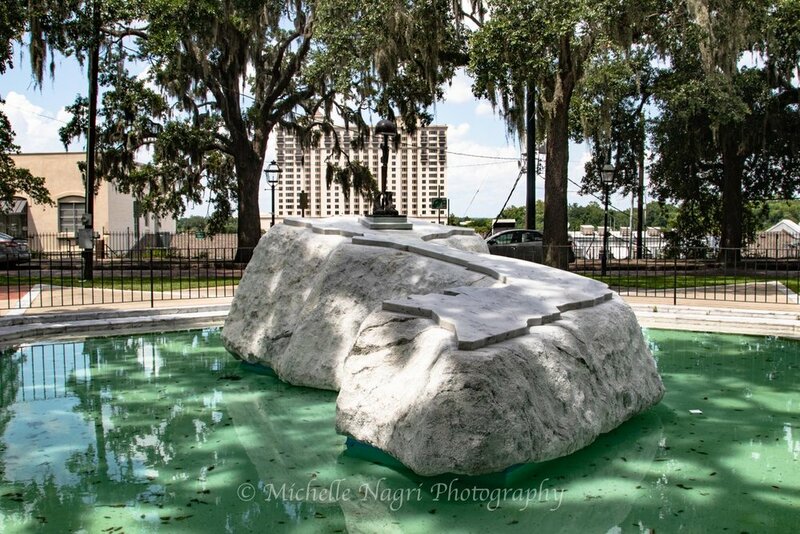 Savannah is overflowing with history, and the story behind the monument is no different. I managed to find an interesting write up here that shed a lot of light on how it came to be. I hope to do a historical piece on it in the future. For now I am immensely grateful for that serendipitous moment of stumbling across this quiet treasure. Thank you all for following along on this epic 365 journey!